I have no idea when I was last here on antpruit.com. I feel bad about it. Sadly, sometimes life gets in the way. The past 3-4 weeks of my life have been full for the most part between work and personal issues. Even now, i'm sittin' here on my recliner hackin' up crap in my lungs because I'm ill. Being sick is for the birds. I hate this. But anyway, let me play "catch up" if you will? When I finally got released from FMLA, that meant getting back into the daily grind of my career as an IT pro and help desk manager. Boy has this been a busy one. I've had the opportunity to meet my new boss as well as meet newly added co-workers and staff. This is the kind of stuff that happens when your employer is purchased. Corporate America, ya know? There's been tons and tons of catching up on things of old, new procedures and policies and just long 12-14 hour days of working. A brotha' has been busy. With that said, I was able to formally meet my new boss down in Sarasota, Florida as well as my new team. This was the first time I've been to Sarasota in almost 15 years. Last time was down there was my college days. Another thing, this was my first ever time traveling in an airplane. Yep. First time. I've been a few places up and down the east coast of the US, but it was always via car. Not that i was against flying, but at those time I just couldn't do it for whatever reason. My loving friends in the Twitterverse and Googleverse were happy to hear about this and thought I should chronicle my trip as best I can. I appreciated that. It was a special experience for me and they wanted to be a part of it. I wanted them to be a part of it as well. So I decided to chronicle my travels with the hash tag #AntOnAPlane. I had fun with this and sharing. I remember tips from my momz and hearing horror stories about the TSA. So when i got to my parking space, i remembered to make a memo of my parking space as well as make sure I was wearing flip flop sandals. 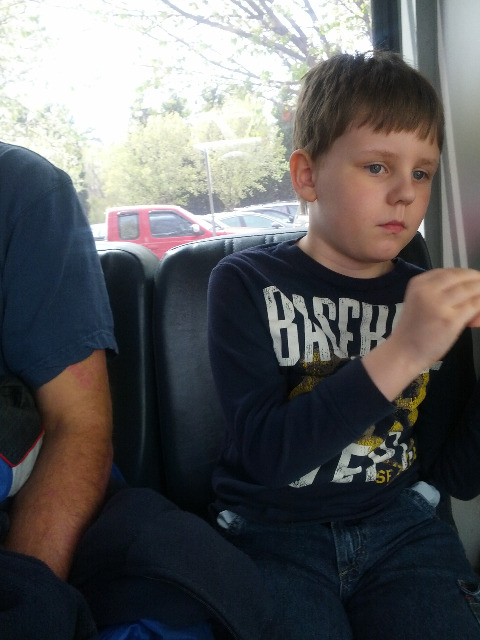 I got on the shuttle to take me to the terminals and this lil' kid wouldn't stop staring at me. I have no idea why. I waved at him, nodded, and he would look away, but then start staring at me again. I could see him looking at me, but he couldn't see my eyes under my sunglasses. stop lookin' at me, kid. I got into the airport, checked one of my bags and off I went onto checking out the place. Granted, I've been to the airport in Charlotte (CLT) several times, but it was either to do a drop off or pick up of a colleague or either visit the parking area to watch planes fly in and out. Once I got inside of the airport, one thing stood out to me. I never did find anything substantial to eat, but I was running out of time before takeoff. So I just grabbed a lil' muffin to hold me over until I reached Florida. The plane i took was a smaller one. Part of me wanted to experience a smaller plane because I've always heard you get more a feel for flying because of it's size. You'll feel the turbulence of flying more so in a smaller plane. I took a snapshot of the plane and could tell it was small. So this plane was small from looking at this picture, but I had NO IDEA how small it was when I actually got on it. I swear I feel like I had to be wedged onto this thing. Walking the aisle, my head seemed to scrape the ceiling. The aisle seemed to be fit for some pencil neck dude, instead of a guy with a somewhat larger frame. I squeezed my way through the aisle and to my seat and settled in. Sadly, the window of the plane was a filthy mess. I was hoping it was clean to give me a better view of the land as we flew. We head out down the run way and I'm pretty excited. I said a prayer to God thanking Him for the opportunity presented to me as well and prayed for protection and safety on the flight. My seat was right near the engines so it was a lil' loud, but not disturbing. The pilot hit the throttle and we were on our way. Over the years I've sat and watched planes take off many, many times and awed at the horsepower and enginuity behind flying. I have to say, the takeoff didn't feel as powerful as I'd hoped. It was definitely moving fast, but I expected more. The moment I felt the plane leave the ground was a thrill for me. My first flight was finally taking place. I remember saying thank you to God and feeling my spirit smile. I remember looking out and seeing nearby things I've driven by for many years begin to shrink in size. I remember passing the Carwoinds theme park within SECONDS of takeoff. This made me realize just how fast we were traveling considering I know how far away Carowinds is. The flight was a cool experience. I could feel turbulence from time to time. It felt like a glorified bus ride. I knew I had about an hour to sit there, so I pulled out my tablet. i planned on finishing an eBook i was reading (5/3/1). But I forgot, that reading in a "vehicle" makes me dizzy and wanna vomit. So that wasn't gonna work. I ended up listening to an audiobook I have on my phone about Pixar. While I listened, i tried snapping a few shots to share with my hardheadz when I landed. I arrived safely in Florida and took in the scenery. My hotel was right near the airport, of course, and the office was just minutes from the hotel. I was excited for Monday. Got unpacked, settled in and finally hit the bed. Meeting the new boss and team was great that week. Our company is really strong and will get even stronger. My team is great. I was able to hangout with them after work hours. I'm so glad we did. It gave me the chance to get to know them a lil' more and them to know me. I have learned that I can be perceived as a certain type of person, but until you ask me directly about myself or spend time with me, I usually prove all assumptions wrong. We had a great time each night that week. Sadly, my superiors may never let them go out with me again as long as alcohol is involved. I mean, I love whiskey, but I have a pretty high tolerance for alcohol and hardly ever get that hangover effect other than being sleepy the next day. I have to laugh now as I look back at my team and how some looked totally run over the next day. (lol) It was fun, though. A lot of fun. 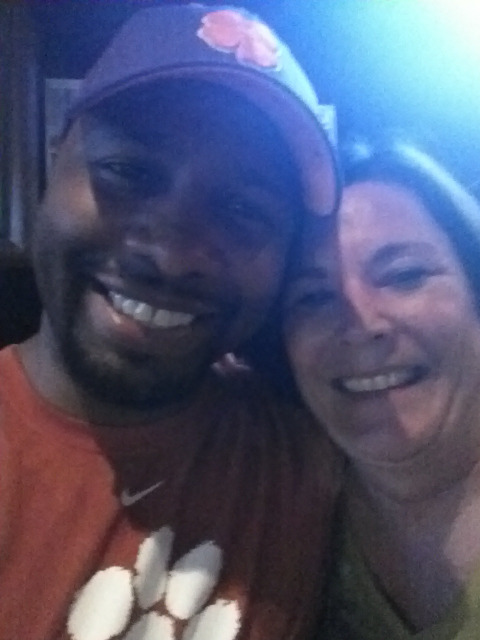 Here's a colleague from another department and I hanging out with everyone else at one of the bars in Siesta Key. She's also a stand up comic. I'm urging Cherry Pepper (her) to get a YouTube channel. Of course, I HAD to time some time to walk on the beach in Siesta Key. The Gulf of Mexico is much prettier than the Atlantic Ocean in my opinion. 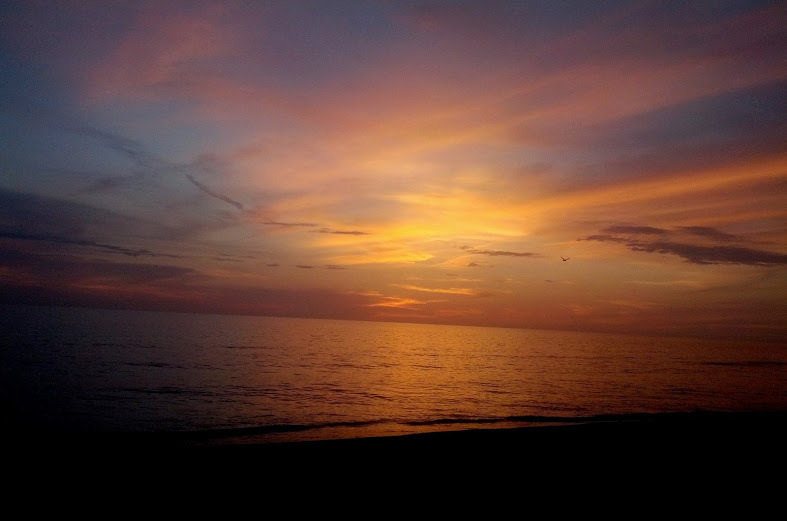 And since Siesta Key is on the west coast of Florida, that meant I could get a view of the sunset. Here's some smartphone photography. So now i'm back at the ranch from a busy (but great) week in Florida. We're still very busy here at home. Lots to do. Lots to continue to learn. Now i'm battling this dadgum sinus infection/flu. I hope to be back at it on Tuesday and closer to a regular schedule of writing and podcasting. I've missed two weeks of recording Stream of Consciousness because of all of this. Be sure to check out the back episodes of the show. Thanks for reading my content, everyone. Thanks for sharing it too. I hope all of you are well. I hope all of you are well and I look forward to chatting with you all soon.